On Monday the 25th of June, trading on the euro closed up. After falling to 1.1628, buyers returned it to the resistance of 1.1675. Against the backdrop of a decline in US Treasury yields, they successfully overcame it to close the day's candlestick at 1.1713. Donald Trump continues to shake up the markets with plans to raise tariffs on Chinese and European goods. Yesterday it was announced that he is planning to place limits on Chinese investment in US technology companies. He also wants to introduce a 20% tariff on car imports from the EU. The topic of trade relations with the US will be front and center at the EU summit of leaders on the 28th and 29th of June. 11:30 UK: BBA mortgage approvals (May). 12:00 UK: MPC member Haskel speech. 12:30 UK: MPC member McCafferty speech. 16:00 USA: S&P/Case-Shiller home price indices (YoY) (Apr). 17:00 USA: Richmond Fed manufacturing index (Jun). 20:00 USA: FOMC member Bostic speech. The euro recovered by 210 pips in 66 hours. The single currency on the hourly timeframe is showing a bullish trend with support at 1.1690. Quotes rose to 1.1720 today during the Asian session. Against the backdrop escalating trade conflicts, risky assets may incur losses by closing time. 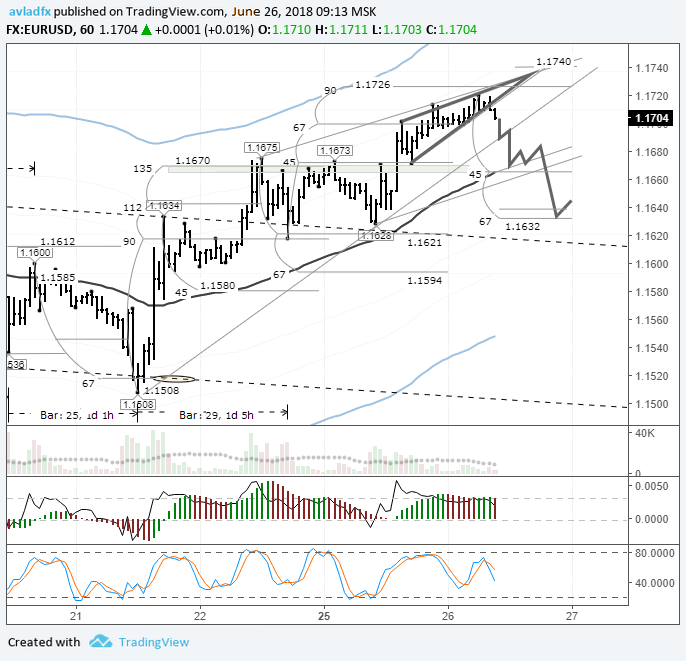 Taking into account that an ending diagonal has been formed on the euro, you can to change 100 dollars in euro in sell, I'm forecasting a drop to 1.1632 today. Perhaps today my view of the euro is a bit too optimistic, but the bearish trend will persist throughout intraday trading, and after 66 hours of upwards movement, we can anticipate a price drop. Moreover, the ending diagonal along with the divergences on the AO indicator are bearish signals. The euro now is already at 1.1693. Sellers need to pass through 1.1690 and the fall will accelerate. The European calendar for today is almost empty. We can now direct our attention to Haskel and McCafferty's speeches to gain an understanding of whether the BoE will raise rates. In the American session, speeches by Fed members Bostic and Kaplan are planned. On Tuesday the 26th of June, trading on the euro closed down. Euro bulls lost all of the gains made following the surge witnessed yesterday. The strengthening of the USD forced buyers to lock in profits. As for the weakening of the single currency, I see more technical factors at play than fundamental ones. Yesterday, I turned my attention to how China is devaluing the yuan to mitigate the impact of US tariffs. The EU will have to follow suit. In this regard, it might be preferable to sell the euro than to buy it. I'm talking about a period of three months. During the US session, the euro fell to 1.1635. 11:00 Switzerland: ZEW survey - expectations (Jun). 11:00 Eurozone: M3 money supply (YoY) (May). 11:30 BOE's Governor Carney speech. 15:30 US: durable goods orders (May), goods trade balance (May). 16:00 Switzerland: SNB quarterly bulletin. 17:00 US: pending home sales (MoM) (May). 17:30 US: EIA crude oil stocks change (Jun 22). 22:00 Canada: BoC Governor Poloz speech. Yesterday's expectations for the weakening of the euro were fully justified. Sellers reached 67 degrees, but did not reach the target of 1.1635. In the Asian session, sellers made a fresh attempt to revisit yesterday's low, but were stopped at 1.1640. A support passes through this level, which was formed from the lows of 1.1618 and 1.1635. At the time of writing, the euro stands at 1.1660. The pair is trading at the 22nd degree from 1.1635. From above it is covered by the balance line, which is at the level of 1.1670. 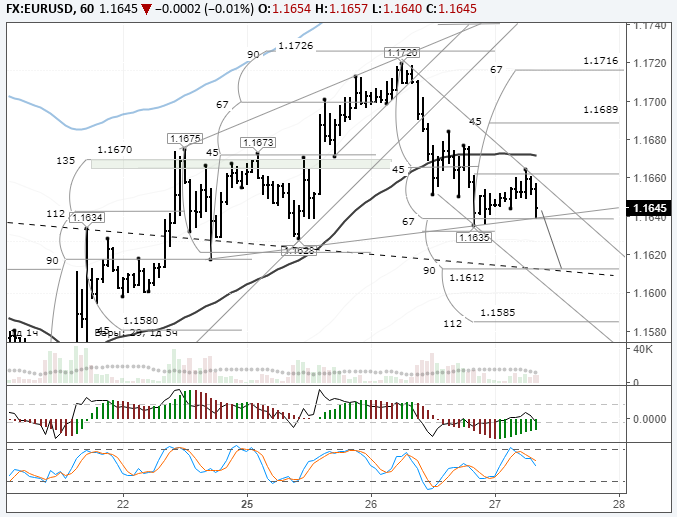 The balance line is strenghtening the resistance at 1.1640. From a technical standpoint, I see the euro exchange rate at 1.1614, so I expect the price to fall to the 90th degree.